A relationship in trouble is one that falls into a negative cascade. One negative reaction leads to the next until there is a seemingly insurmountable wall between the two partners. Relationships that enter this destructive phase need attention and can benefit from the trustworthy, confidential intervention of a professional therapist. Sometimes the two partners fail to notice when they have entered this cycle because they feel justified in reacting as they do – but the price they pay is the slow erosion of their relationship. It may seem impossible for them to recapture the love that brought them together in the first place. Criticism involves attacking your partner’s personality or character, not just his or her behavior. Criticisms vs. Complaints: To repair this pattern, try stating your criticisms as complaints that your partner can respond to and not take as a personal attack. Make your complaints specific and talk about them as a behaviors that can be changed. Take responsibility for your own part in the problem. If the criticisms within a relationship are not addressed, the interaction between the two partners may lead to contempt. This stage of the negative cascade is seen when there is an attempt to insult your partner, as in, “You’re just a pig around the house and I don’t know how I could ever have loved you.” Contemptuous remarks go right to the heart of your partner’s sense of self. They are meant to hurt. There are several forms of contempt, such as name-calling, insulting jokes about your partner, mockery, and body language (such as sneering, eye rolling, or curling your upper lip). If a relationship gets to this stage, it is difficult to recapture the love and it may be vulnerable to a breakup. To make this situation better, both partners need to identify the contempt and to replace it intentionally with words of admiration and respect. They need to work on trying to achieve the ratio of five positives to one negative. Defensiveness is an attempt to protect oneself and to guard against further attacks. When a person is bombarded with criticism and indications of contempt, it is natural to feel like a victim – and victims go into a defensive posture (“I haven’t done anything wrong, so stop picking on me”). The victim feels justified in doing this. However, what is not often understood is that defensiveness tends to escalate a conflict rather than quelling it. The partner who does the blaming feels that the other one doesn’t “get it” and is resistant to addressing the problem. This can result in a standoff where constructive communication comes to a halt. Rather than trying to mutually solve the problems in the relationship, the two partners spend their energy defending themselves. Nothing is resolved, the conflict escalates, and the negative cascade continues to damage the relationship. The way to address the defensiveness phase of the cascade is to learn how to stay calm. When anxiety is reduced, it is possible to ward off criticism, put it into perspective, and avoid reacting defensively. It is helpful to learn how to react to the overall situation rather than to only the words that are spoken in moments of conflict. Staying calm protects us against the possibility of feeling overwhelmed during heated moments. In the final phase of the negative cascade the couple finally breaks off normal contact. Gottman found that 85 percent of stonewallers are men. This phase characterizes a stage in the damaged relationship where one of the partners decides that no communication is better than the destructive feelings and words that have prevailed prior to this point. Withdrawing from interaction sends a powerful negative message – and the stonewaller may feel that this is the only option left. It is important to note that a common fighting technique between partners is for one to use the “silent treatment” – but this is not the same as stonewalling. The silent treatment is used on occasion, while stonewalling is an habitual reaction for the couple and is preceded by the first three phases of the negative cascade. Relationships that get to this point are still salvageable, but they are fragile. At this stage, the couple must want to work hard to save the relationship. 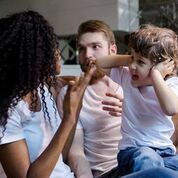 In order to address the problem of stonewalling, the couple should address issues like learning to stay calm, speaking non-defensively, and becoming aware of the thoughts that maintain their distress. A therapist can help a couple learn all of these skills.